An experiential program for individuals who want to partner with their dogs to create powerful transformation in all aspects of their lives. Are you effective in your leadership role? Do you create freedom from stress and anxiety? Do you create and live a life you love? Or is the drama of life ruling you? I believe one of our greatest teachers and helpers in life are the dogs that live with us. Dogs are energetically connected to us. Sometimes dogs act out because we are out of alignment with our own life. Their dependence on us creates a strong bond where they can take on our healthy as well as unhealthy negative energy. And other times dogs misbehave because they lack the leadership they need from us. Since dogs live so close with us, they are wonderful teachers. They can help us tap into our heart. Their behavior often mirrors our leadership effectiveness. Their love for us can inspire us to transform our way. Through canine-assisted coaching, we will partner with your dog to help you rediscover your authentic leader and create a life you love. 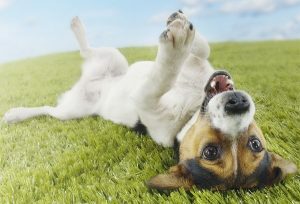 In a self-discovery process and through playful interactions with your dog, areas for growth will surface. You will expand your awareness of patterns that may be limiting your growth in relationships, career and leadership roles. You will learn to be present. You will explore more effective behaviors and you can partner with your dog who will help you transform in a way that feels better for you and allows you to create the results you want. If you like to partner with your dog to make some major changes in certain areas of your life and if you want to strengthen your bond with your dog as a direct effect of this program, let’s have a conversation. The best way to get an idea of my approach to coaching is to experience it first-hand. I invite you to click here and let’s schedule a conversation to chat.